So we all know I'm a tad obsessed with peplum, however I'm learning the hard way that not all peplum is the same. After buying nearly 10 new peplum tops and only 2 working, I've come up with my little list of peplum rules. Admittedly I'm super particular, and in the end, wear what YOU like and feel great in. Fashion is your way of expressing yourself, so don't feel confined to rules! These are just tips that I use and maybe someone else might find them useful. Peplum "skirt" thing has can't be too short or too long - I prefer to go past my belly button and stop at largest part of my hip. Longer in the back is great, like a high low pep, but man the front can't be too short. It can't start too low - I like mine to start higher at my natural waist NOT at my belly button. I wear my belts that high too. I prefer that silhouette. Not TOO much "skirt" - I bought one the other day that was SO "poofy" I guess for a lack of better word. I like mine to be a skirt but also go straight out. Once it starts to "ruffle" or gather, I hate it. Then it feels like a mini dress. 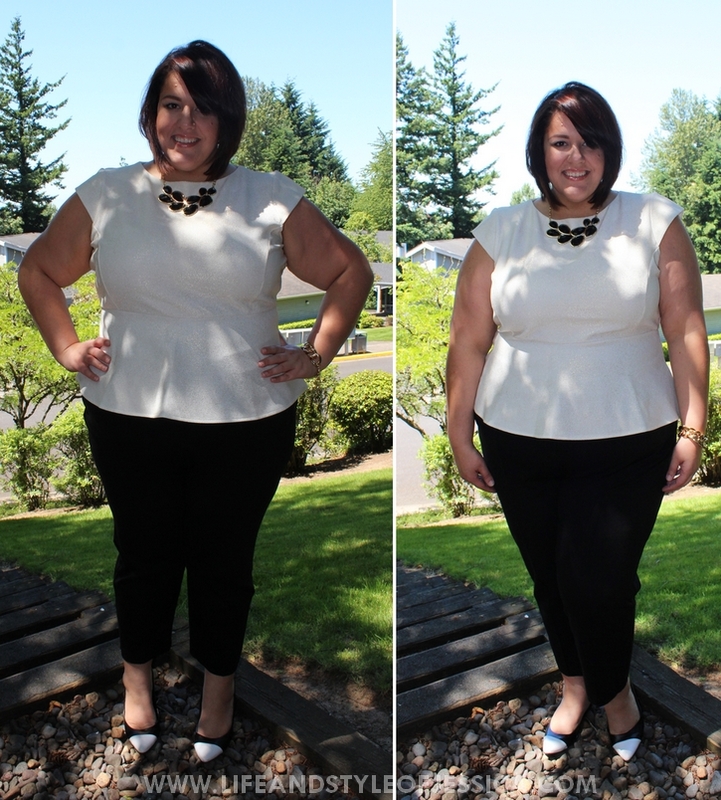 This peplum top gifted to me from SimplyBe is EVERYTHING - EVERYTHING! The fabric feels like a foam type material, so I holds it's dramatic shape - like the "gaga" shoulders my friends called it. The foiling in the top is absolutely gorgeous, even if hard to photograph. I paired with the same pants and top from my last post. Group shot! From Left - Barbara PFW Production Manager, John Jay, Justin from Clear Channel Radio, Me, Rich and Kyle.